We’ve been a little slow lately with creating cute graphic tees out of used shirts. We had to plan a completely DIY, waste-free wedding, and it was not easy. 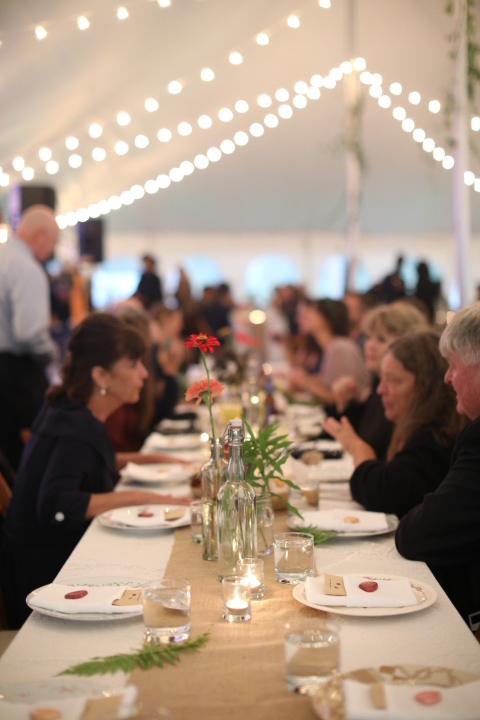 After a year of research, plus managing a property owner, a tent rental company, a band, a local restaurant… we worked it out so that every aspect of the day was carefully curated to be both beautiful and good to the planet. Below are some of the susty things we did for the low-impact day. The wooden fence in my parents’ backyard fell apart sometime before wedding planning. My dad took a saw to it while my mom did the hand-painted lettering. She had used the same “signs” for my shower too, and simply sanded them down and changed the words for the wedding. Up-cycle much? Um these are amazing and so worth getting for every event and for bartenders everywhere! These were rad and adorable. We carefully ordered a stamp to be made (which we ended up using on like everything wedding related) and purchased wildflower seeds in bulk plus recycled paper coin envelopes. Boom. Easy. With fear that the seeds wouldn’t be enough, we also picked up vegan chocolates for each guest from a local candy store we found called Krause’s. If in doubt about a wasteful favor: you can’t go wrong getting something your guests can consume, and especially something local. Oh dear god. This was a huge situation. Turns out people like to stick trash on their fridge for 6 months to stare at in case they forget a date. I’m kidding, I get it. Save the Dates are cute. If I weren’t so broke, maybe I would have printed them on plantable paper. But truly, so unnecessary. I’m a digital graphic designer, hello, so I went ahead and did save the dates and invites through MailChimp. People got over it, and hey, some people even learned how to use their email. Everything was used, rented, or found in nature. The lace, ribbon, bottles, jars, and even 150 mismatch china plates were carefully selected from yard sales, thrift stores, or things we had lying around. We tied anything and everything up with biodegradable materials like twine or burlap, hung branches from the tent poles and placed ferns on the tables. Find a great chef like the one at Miss Lucy’s, and don’t tell anyone you’re doing this. They won’t even notice. We made the very big mistake of letting people know it was going to be all veg, which left room for all kinds of [wrong] judgement leading up to the big day. The food was incredible, bye. As per our caterer’s suggestion, we ordered and picked up all our own liquor (supporting another amazing local business!) and returned whatever bottles were unopened. This is the way to do it if you can find a liquor store willing to do returns. We ordered a small cake from Happy Zoe Vegan Bakery in Greenpoint, and totally forgot to cut it at the reception. Our caterer made mason jar desserts as well, which were killer. We picked up* wildflowers from a farm called Shoving Leopard. By far my favorite transaction throughout the whole wedding. Being a nice person goes a long way. With the incredible flowers, I was able to arrange the vase displays for each table and weave Eucalyptus crowns for my girlfriends. We used up all the flowers, gave some away, and I took the rest home to dry. I have since propagated the raspberry branches and planted them in soil! *confession: we did have to purchase plastic buckets in order to pick up the flowers. I am still annoyed by this, but at the very end some things fell through the cracks. We gave them to my dad after the wedding who will at least find use for them. Sorry guys, I’m not perfect, just super close. I got my dress from Leanne Marshall who won a season of Project Runway, uses recycled fabrics and sustainable practices with her brand, and is a f***ing incredible designer. I got very lucky—my dress was a sample (not even made new!) and happen to fit perfectly. It was altered by the amazing ladies of Diana Deane in Williamsburg. I tried to argue against a bridal party because I think they’re weird and gendery, but I lost, and the friends who ended up helping throughout the year got a crown made by me, a walk down the aisle, and, either got themselves a dress from Reformation, or, promised whatever they bought that they would wear again. It was the best I could do without being a completely annoying psycho. We initially liked the idea of no gifts/donating to charity thing. It didn’t work. My mom and sister insisted on a shower (and they did a great job and did everything plastic-free for me! ), so, instead of getting a bunch of stuff we didn’t need, we attempted putting together a clean registry. I like that on Zola you can select a number of charities to donate to, though selecting earth-friendly products on there was not super easy. We did our best. With a DIY outdoor wedding, we had to rent trailer restrooms. They were very nice, and I made sure to fill them up with all the products you might find at any old wedding, but, everything I bought obviously had to be biodegradable or recycled, ur duh. I even made my own spray deodorant for each stall, finished off with tea-stained labels. Can you say crunchy? Favorite brand in the bathrooms was the plant-based GLITTER by BioGlitz. Check out some photos below. If you have any questions, feel free to reach out! I’m pretty much a professional now. Susty Clothing is a Trademark pending under LeeAna Benson, LLC.